Coriander – the nation’s favourite herb? Coriander has been hitting the news recently, as it has been revealed that coriander is the favourite fresh herb in Britain, with over 30 million packs sold in 2013, due to the growing popularity of Asian and Mexican food. Coriander is a key ingredient today among chefs such as Jamie Oliver and Yotam Ottolenghi. Coriander (Coriandrum sativum) is a small annual herb, found growing today from southern Europe to north Africa and south-west Asia. The seeds and leaves are most commonly used in cooking, but the roots are also used in Thai dishes. The use of coriander seeds in the past is evidenced by written texts, such as Linear B tablets, and archaeobotanical remains of the seeds, which are technically the mericarps or fruits of the plant. 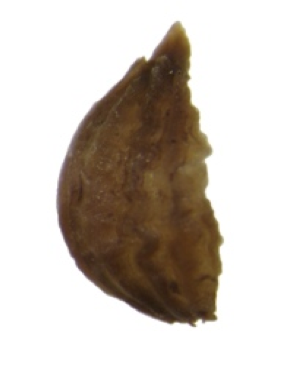 Seeds are far more common in waterlogged sediments and mineralised deposits than in charred samples, as the oil contained in the seeds makes them burn quickly. The leaves are far more delicate, and have never been recovered from archaeological sites. The first recorded use of coriander as a flavouring is from Nahal Hemar cave in Israel, c. 6000 BC (the pre-pottery Neolithic B period), where 15 dessicated coriander seeds were found. Coriander seeds have also been found at numerous Neolithic and Bronze Age sites in the eastern Mediterranean (Zohary et al. 2012, 163). Amongst those ancient people with a taste for coriander was the Egyptian pharaoh Tutankhamun, as several baskets of coriander seeds were found in his tomb (Hepper 1990). As in modern day Britain, coriander was equally popular in the Roman world, with the leaves or seed used in 18% of the recipes contained in the writings attributed to Apicius (Cool 2006, 66). Coriander features in such classic Apician recipes as “lentils with chestnuts” (seeds), “asparagus patina” (leaves), and “marrows, Alexandrian fashion” (seeds). Coriander was also one of the most popular plants to be adopted in north-western Europe. At the Late Iron Age oppidum of Calleva Atrebatum (Silchester), southern England, coriander was actually imported before the Claudian Invasion of AD43, as seeds were found in waterlogged sediments in a well dated to c. 20/10BC-10/20 AD (Lodwick 2014). Coriander was also popular with the military, as seeds have been found from forts at Alchester, Bearsden, Castleford and Ribchester. Several centuries after this, coriander was the most popular new flavouring in the whole province, recorded in 50% of all studied sites c. 100-300 AD (Van der Veen et al. 2008), which included not only towns, forts and villas, but also rural settlements. Across north-western Europe as a whole, coriander is characteristic of Roman settlements (Bakels and Jacomet 2003). A great example is the rural settlement of Oss-Ussen in the Netherlands, on the edge of the Meuse valley (Bakels et al. 1997). During the Roman period, people lived in hamlets of several houses, within ditched enclosures. Coriander was used from the second century AD onwards, alongside beet, celery and summer savory, although these foods would have been eaten alongside ‘Iron Age’ ingredients such as barley, flax, emmer and spelt wheat. Other than spicing up food in the Roman world, coriander may have been used in other ways. Coriander could have been used as an aromata in perfumes (Miller 1969, 6-7) or to preserve meat (Wiethold 2010). To feed the need for coriander, it was grown on a large scale in Egypt (Prance and Nesbitt 2005, 162). Coriander would have been transported in small jars or sacks, and was being sold in shops in Roman Britain a few decades after the Roman invasion. Coriander seeds were found amongst the charred debris from a burnt pottery shop at Colchester, destroyed during the Boudican revolt (Murphy 1977). A similar shop at 1 Poultry, London, was also selling coriander, alongside mustard, dill, fennel, and black cumin (Hill and Rowsome 2011). There are also indications that it was grown in Roman towns in Britain. Coriander seeds were very common in waterlogged samples from Early Roman wells at Insula IX, Silchester, suggesting small plots of coriander were growing amongst the timber houses. After the decline of the Roman Empire at the beginning of the fifth century AD, coriander was used far less. Seeds are rarely found from archaeological sites dating to the Early Medieval period, AD 500-950, in north-western Europe. The sites where the seeds have been found are mainly trading settlements and large towns. Coriander did become more popular from AD950-1500, but use of the flavouring was limited to town-dwellers (Livarda and Van der Veen 2008). If the Roman period is anything to go by, it seems the current popularity of coriander is only going to increase! Bakels, C., Wesselingh, D. and Amen, I. 1997. Acquiring a taste: the diet of Iron Age and Roman period farmers at Oss-Ussen, the Netherlands. Analecta Praehistorica Leidensia 29, 193–211. Hill, J. and Rowsome, P. 2011. Roman London and the Walbrook Stream Crossing: Excavations at 1 Poultry and Vicinity, City of London Part 2. London: MoLA Monograph 37. Lodwick, L. 2014. Condiments before Claudius: new plant foods at the Late Iron Age oppidum at Silchester, UK. Vegetation History and Archaeobotany 23: 543-549. Wiethold, J. 2010. L’histoire et l’utilisation de la coriandre (Coriandrum sativum L.), à partir du deuxième âge du Fer jusqu’au début de l’époque moderne. Culture, utilisation, sources écrites et données carpologiques. In C. Delhon, I. Théry-Parisot and S. Thiébault (Eds. ), Des Hommes et des Plantes. Exploitation du Milieu et Gestion des Ressources Végétales de la Préhistoire à nos Jours. XXXe Rencontres Internationales d’Archéologie et d’Histoire d’Antibes (pp. 141–159). Juan-les-Pins: Editions APDCA. Cool, H. 2006. Eating and Drinking in Roman Britain. Cambridge: Cambridge University Press. Hepper, N. 1990. Pharaoh’s Flowers: The Botanical Treasures of Tutankhamun. University of Chicago Press. Miller, J. I. 1969. The Spice Trade of the Roman Empire (29 BC to AD 641). Oxford. Murphy, P. 1977. Early Agriculture and Environment on the Hampshire Chalklands: circa. 800 B.C. – 400 A.D. University of Southampton. Unpublished MPhil thesis. Prance, G. and Nesbitt, M. 2005. The Cultural History of Plants. New York: Routledge. Zohary, D., Hopf, M., & Weiss, E. 2012. Domestication of Plants in the Old World: the Origin and Spread of Domesticated Plants in South-West Asia, Europe, and the Mediterranean Basin. Oxford: Oxford University Press. Bakels, C. and Jacomet, S. 2003. Access to luxury foods in Central Europe during the Roman period: the archaeobotanical evidence. World Archaeology 34 (3), 542–557. Livarda, A. and Van der Veen, M. 2008. Social access and dispersal of condiments in North-West Europe from the Roman to the Medieval period. Vegetation History and Archaeobotany 17 (S1), S201–S209. Van der Veen, M., Livarda, A. and Hill, A. 2008. New plant foods in Roman Britain — dispersal and social access. Environmental Archaeology 13 (1), 11–36. This entry was posted in Environmental archaeology, Ingredients and tagged Apicius, archaeobotany, Bronze Age, coriander, Jamie Oliver, Linear B, London, Neolithic, Ottolenghi, Roman food, Silchester on October 7, 2014 by lisalodwick.